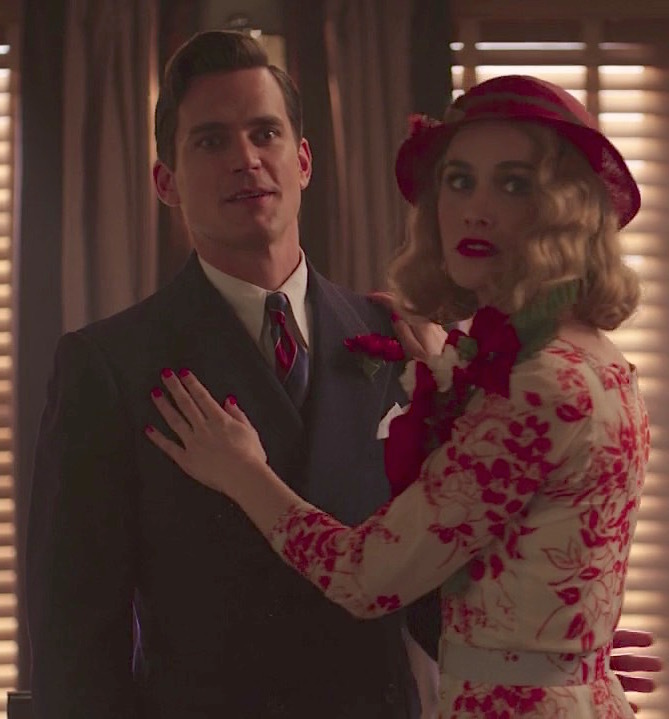 The sixth episode of Amazon Video’s first and only season of The Last Tycoon, adapted from F. Scott Fitzgerald’s unfinished novel The Love of the Last Tycoon, kicks off the holiday season at Brady-American Studios where studio chief Pat Brady (Kelsey Grammer) and his one-time protégé, ambitious visionary producer Monroe Stahr (Matt Bomer), hoping for a Christmas miracle on their upcoming film, Angels on the Avenue. Pat Brady: Well, if it isn’t the Jew who invented Christmas. Monroe Stahr: I think another Jew gets credit for that one. Double-breasted three-piece suits have sadly fallen by the wayside after their glorious heyday in the 1930s, and costume designer Janie Bryant made the most of their elegant drape with a number of double-breasted business suits that serve as the de facto uniforms for series leads Matt Bomer and Kelsey Grammer. 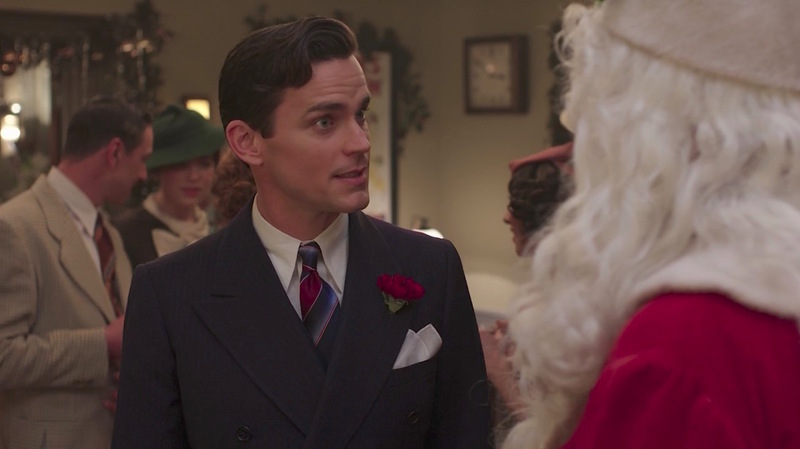 In “A Brady-American Christmas”, Monroe dresses for his office Christmas party in a navy striped wool three-piece suit that had made its first appearance in the series’ third episode “More Stars Than There Are In Heaven” with the same striped tie. The double-breasted suit jacket has broad peak lapels with straight gorges and sharp points. It’s a festive occasion, so Monroe wears a red carnation in his left lapel to celebrate, also calling out the maroon stripes of the tie. A confrontation with Santa Claus is a surefire way to end up with coal in your stocking. Tread lightly, Monroe. Monroe champions the wearing of simple white pocket squares with all of his tailored suits, and this is no exception with a two-point folded white linen kerchief stretching out of his welted breast pocket. The six-on-two button suit jacket also has flapped pockets on the hips, in line with the lowest row of buttons; the two lower rows of buttons are placed closer together than the center row is with the vestigal upper buttons. Monroe Stahr shows how a conservative dresser can still look interesting, even in a sea of festive holiday revelers in vivid shades of red and green. One argument against double-breasted three-piece suits is that it renders the waistcoat totally unseen beneath the jacket’s full wrap. In the 1930s, this was less of an issue as it provided warmth in a less air conditioned world, and it allowed a gentleman to still look “dressed” when he needs to remove his jacket. Monroe settles in for what he believes will be a productive Christmas Eve of poring over movie scripts, removing his jacket and revealing the single-breasted matching waistcoat (or vest). Per era trends, the waistcoat has a high-fastening front, though it still remains all but hidden under the closed jacket, with six buttons down the front; Monroe correctly and comfortably leaves the lowest button undone over the notched bottom. The lining and back are finished in navy satin, and there are four welted pockets on the front. Peering out from the armholes of the waistcoat are Monroe’s suspenders (braces) that he wears to hold up his trousers. Although barely seen, these red-and-navy striped suspenders also coordinate with the color palette of his suit and tie. Many of Monroe’s trousers are made with belt loops as well as inner-waistband buttons to accommodate suspenders, although he correctly opts for the latter here; suspenders are preferable to belts when wearing a three-piece suit to avoid the unsightly bulge of a belt buckle beneath the waistcoat. The double reverse-pleated trousers have side pockets, jetted back pockets, and turn-ups (cuffs) that break over what appear to be black leather cap-toe oxfords. Monroe tends to wear socks that coordinate with his trousers, so he likely wears dark navy socks with this outfit. Monroe’s productive night in is interrupted by a party invitation from Clint Frost (Eion Bailey), an amiable if overly sensitive actor in the Brady-American studio system. 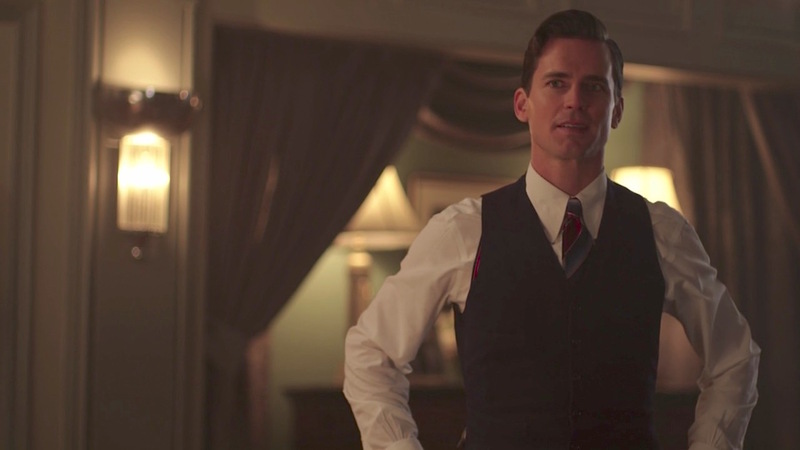 Monroe wears one of his usual white cotton shirts with its well-starched and perfectly shaped long point collar, designed to perfectly follow the lines of his waistcoat’s chest opening. The shirt buttons up a wide front placket and has double (French) cuffs with buttoned gauntlets. The French cuffs are fastened with a set of small gold-toned cuff links. Hard at work but still smiling: the Monroe Stahr work ethic in action. 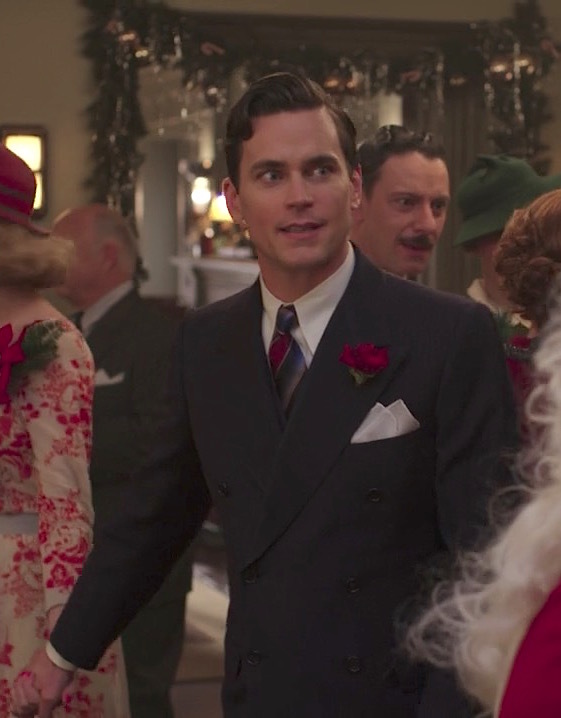 This striped silk tie is no exception, not only complementing Bomer’s blue eyes but echoing the colors of the holiday season with maroon striping. All stripes are in the European “uphill” direction, crossing from the right hip up to the left shoulder. The striping pattern consists of wide stripes in burgundy, a navy-to-light blue gradient, and solid navy, all separated by thin white shadow stripes. Monroe wears a gold signet ring on his left pinky, a common affectation of the era. The ring is etched with the initial “S.” to stand for both his professional surname of Stahr as well as his birth surname, Sternberg. “S” for Stahr and for Sternberg. 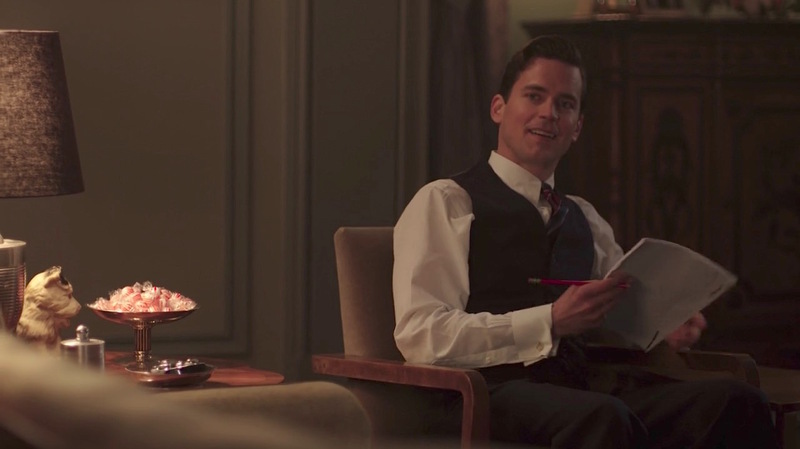 After receiving two new wristwatches for his birthday earlier in the season, Monroe takes to wearing the steel round-cased watch he received from Pat Brady in Pat’s attempt to one-up the gold dress watch Monroe was given by Louis B. Mayer. Not clearly seen in these episodes, Monroe’s watch from Pat has a minimalist white dial and a black leather strap. In the spirit of gift giving, check out the watch Monroe receives from Pat Brady in the finale of “Burying the Boy Genius” (episode 1.04). 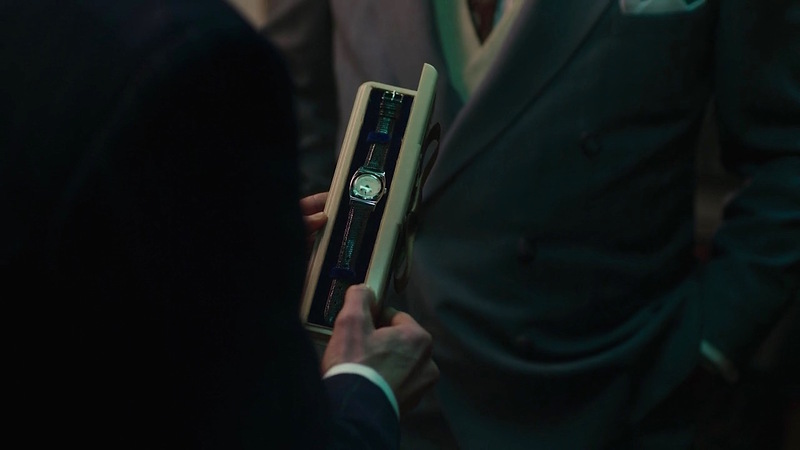 Monroe is wearing a different striped navy suit, with a widely spaced white chalkstripe, when he receives the watch. It’s hard to imagine a holiday party without Frank Sinatra, Ella Fitzgerald, Perry Como, or Bing Crosby on the soundtrack. In December 1936, the first three were just getting their starts locally that would propel them to stardom within the next decade, and Bing – though a bona fide star since leaving Paul Whiteman’s popular orchestra in 1930 – had yet to record a Christmas record, let alone anything as iconic as “White Christmas”. 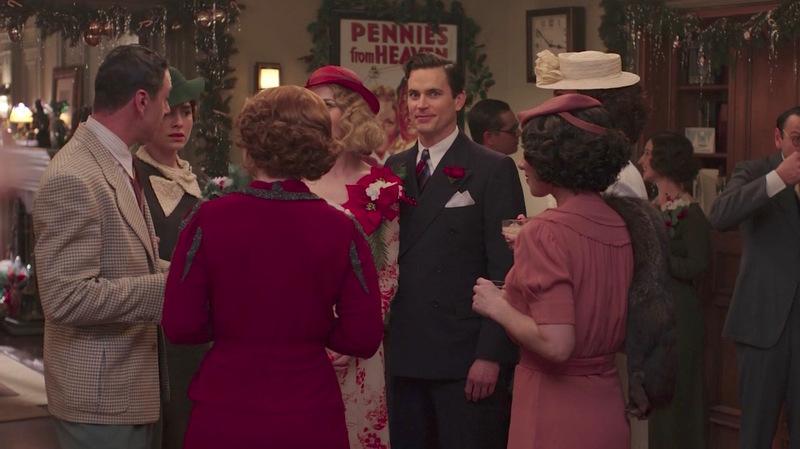 Thus, The Last Tycoon turns to even older recordings of our holiday favorites, including the original recording of “Winter Wonderland” that would play during several of the episode’s later seasons and over the end credits. Written by Felix Bernard and Richard B. Smith in 1934, “Winter Wonderland” was first recorded that October in New York City by Richard Himber and his Hotel Ritz-Carlton Orchestra, featuring vocals by Joey Nash, for Bluebird Records (a division of RCA Victor). The record, named “Winter Wonderland – Fox Trot” to follow conventions of the era, was quickly noticed and re-recorded by other outfits, with the more popular Guy Lombardo and his Royal Canadians cutting their own version only six days later for Decca Records that would crack the top 10. Though it lacks any references to the holiday itself, “Winter Wonderland” has come to be regarded as a popular Christmas song and a mainstay of holiday albums from major artists including Elvis Presley, Dean Martin, Dolly Parton, and Eurythmics… in addition to Frank, Ella, Perry, and Bing, of course. 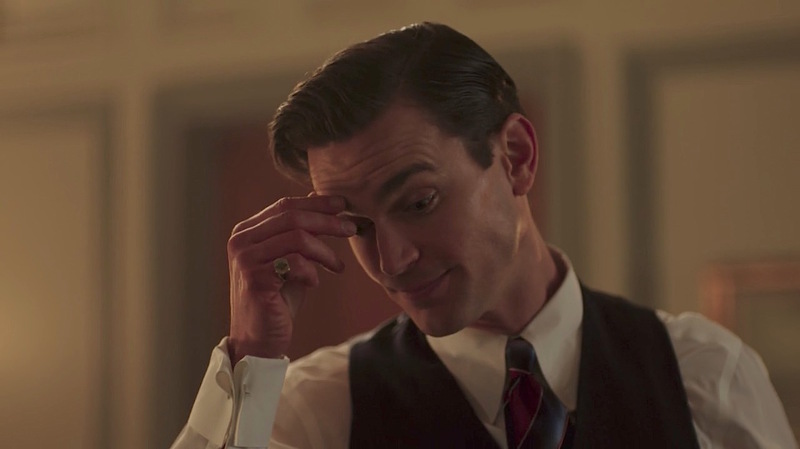 Monroe Stahr (Matt Bomer) and Kathleen Moore (Dominique McElligott), surely to be added to the naughty list after being caught in Monroe’s office. The dapper Monroe Stahr dresses to impress for his office holiday party, nodding to the festivities with a tasteful red carnation in his lapel rather than the now-ubiquitous ugly Christmas sweater. Of course, this is only Monroe’s office suit for the daytime corporate party. After accepting Clint’s invitation to an evening soiree, he changes into a debonair black three-piece dinner suit. Check it out on Amazon Video. 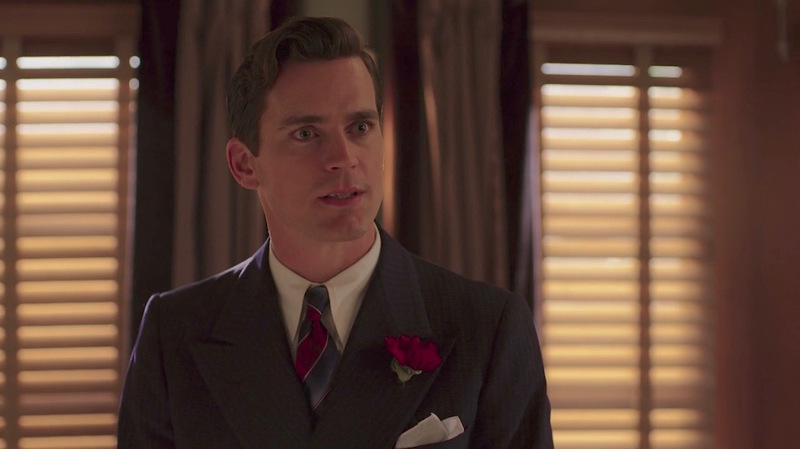 As mentioned above, Monroe seems to be wearing the same suit in the third episode, “More Stars Than There Are In Heaven” for a meeting in Pat Brady’s office and an evening rendezvous with Kathleen at his beach house. 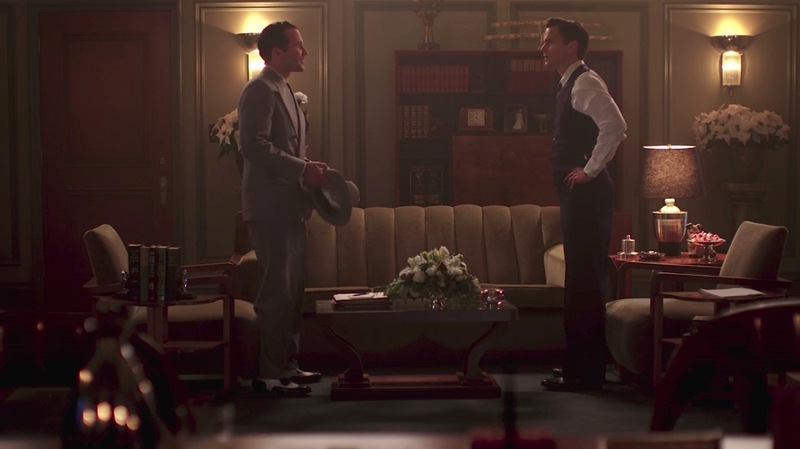 Monroe sits in Pat’s office, sporting the same tie and possibly same suit, in “More Stars Than There Are In Heaven” (episode 1.03). Dressed down to his shirt, waistcoat, and trousers at the beach, revealing the size and shape of his shirt’s distinctive point collar in “More Stars Than There Are In Heaven” (Episode 1.03).